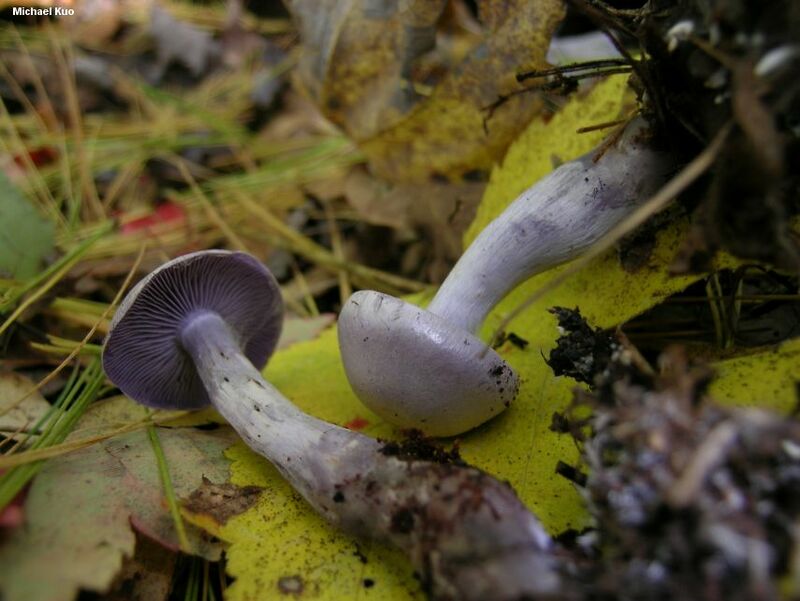 My use of the European name "Cortinarius azureus" represents a best-fit scenario; there is a small Cortinarius in the traditional subgenus Sericeocybe that appears in eastern North America's beech forests and features lilac colors from head to toe, along with nearly round, almost smooth spores. It is more purple than the similar Cortinarius anomalus, and its spores are less warty. 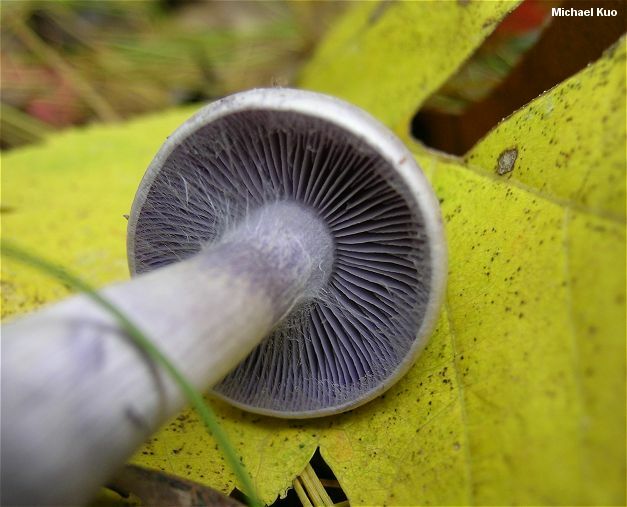 Cortinarius lilacinus is a North American species name for another completely lilac Cortinarius, but that species is much larger and stouter, and features ellipsoid spores. According to the Index Fungorum Cortinarius azureus is now a synonym of Cortinarius anomalus, but the Index does not provide an authority for the synonymy (this is an ongoing problem with the Index that regular readers have heard me complain about before). At any rate the Friesian descriptions of the two taxa are relatively clear about the fairly substantial morphological differences between the species--and, frankly, neither name is likely to be accurately applied to the North American mushrooms I am describing once the genus is subjected to contemporary study on our continent. Ecology: Mycorrhizal with beech; growing alone, scattered, or gregariously; fall; probably to be expected in North America throughout the range of the host tree (see the map on the linked page). Cap: 2-6 cm; convex to bell-shaped, becoming broadly convex, flat, or broadly bell-shaped; dry; silky, developing a sheen with age; lilac, developing brownish hints, especially over the center; the margin often slightly wrinkled. Gills: Attached to the stem, sometimes by a notch; close; lilac at first, becoming rusty brown; covered by a white cortina when young. Stem: 3-10 cm long; up to 1 cm thick; more or less equal, or with a slightly swollen base; dry; lilac, fading to whitish from the base up; silky to nearly smooth. Flesh: Whitish to lilac or purple (especially in the stem). Odor: Sweet and slightly unpleasant, slightly radishlike, or not distinctive. 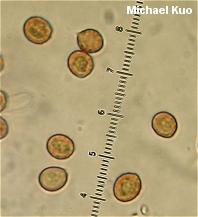 Microscopic Features: Spores 6-10 x 5-8 µ; subglobose to very broadly ellipsoid; weakly verrucose. Cheilo- and pleurocystidia absent. Pileipellis a cutis. REFERENCES: Fries, 1838. (Saccardo, 1887; Moser, 1983; Phillips, 1991/2005; Breitenbach & Kränzlin, 2000.) Herb. Kuo 10160406.